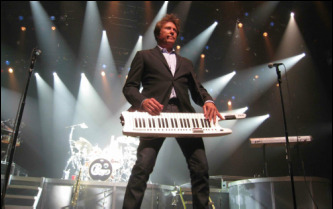 ﻿﻿﻿"The song “25 or 6 to 4” appeared on Chicago II and was written by organist/vocalist Robert Lamm. The title and lyrics have puzzled many since it appeared in 1970. Some say it's a drug reference, suggesting a unit of measurement involving the quantity of joints that can be rolled from a what-used-to-be dime bag. Some feel it's about looking for spiritual revelation, undergoing a mysterious soul-searching journey. Perhaps you're too young to recall that in the late '60s and '70s it was a popular parlour game—if not quite an intellectual pursuit—to read hidden messages and double meanings into song lyrics. Many people thought “Hey Jude” was about shooting heroin. Just about everything Bob Dylan wrote went through hours of scrutiny by his fans. Did you ever check into the “Hotel California” by the Eagles? Many of the Rolling Stones songs were supposedly about drugs, though it's hard to ignore the more explicit meanings (“You make a dead man come.”) What about “I Am the Walrus,” which was supposedly written on an acid trip about Paul McCartney's greatly exaggerated and rumored demise? Goo goo goo joob, baby. ​Waiting for the break of day — He's been up all night and now it's getting close to sunrise. Searching for something to say — Trying to think of song lyrics. Flashing lights against the sky — Perhaps stars or the traditional flashing neon hotel sign. Giving up I close my eyes – He's exhausted and his eyes hurt from being open too long, so he closes them. Staring blindly into space – This expression is often on the faces of writers and reporters. Trust me. Getting up to splash my face — Something you do when you're trying to stay awake, though a good cup of Starbuck's does wonders for me. Wanting just to stay awake, wondering how much I can take — How far can he push himself to get the song done? Should I try to do some more? — This is the line that makes many think it's a drug song. But it is just as easily construed as a frustrated writer wondering if he should try to do some more lyrics/songwriting. ​As for the curious title, Lamm says, “It's just a reference to the time of day” — as in “waiting for the break of day” at 25 or (2)6 minutes to 4 a.m. (3:35 or 3:34 a.m.) I think we can take Lamm's word for the whole thing, because, when it's that early in the morning, does anybody really know what time it is?